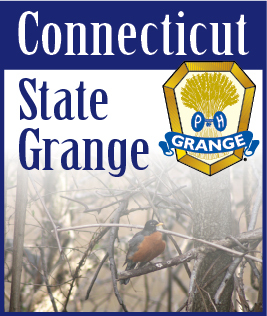 This is your last reminder that your entries for the judging must be at Cheshire Grange Hall by 9 AM on Saturday, June 9th so that the judging can proceed at 10 AM. I hope that we will have lots of judging to do and I know that the entries will be of the highest quality as always. Looking forward - we will be looking for the entries for the quilt squares to be brought to State Session in October. They need to be in the log cabin pattern and in a fall color motif and be 10.5 inches by 10.5 inches. Just a reminder for the Granges to send in their donations for the CWA projects. They should be sent to the Central Office and made out to the CT State Grange. Thank you for your participation and winners will be listed in a future issue.